Relatives of the victims of the Qasim Nagar massacre raised anti-government slogans as they collected the mortal remains of the dead from the cremation ground today even as a complete bandh was observed here in protest against the incident. Protest rallies were held at several places. The toll increased to 28 with one more person succumbing to his bullet wounds. No terrorist involved in the incident has been arrested so far and an attempt is being made by certain agencies to create an impression that the massacre was the handiwork of land-grabbers. However, the security forces have ruled out this theory. Almost all shops and business establishments in the town remained closed. Private vehicles plied normally. A bandh was also observed at Kathua and Reasi. The security forces have been deployed in strength in the town. Twentyseven of those injured have been admitted to Medical College Hospital here. This is the second major terrorist strike in the past two months. Terrorists gunned down 34 persons, mostly family members of defence personnel, at Kaluchak, near here, in May. As many as 142 civilians and security personnel have been killed in terrorist strikes in the past year. 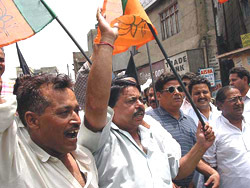 Reports said bandh was also observed in Ramban, Bhaderwah and Kishtwar. Meanwhile, pradesh BJP leaders, including the state president, Mr D.K. Kotwal, have demanded the resignation of Chief Minister Farooq Abdullah. They also demanded the imposition of Governor’s rule in the state and urged people to maintain communal harmony. The Jammu and Kashmir Sikh Students Federation condemned the massacre and charged the state government with failing to protect the poor. Parliament today strongly deplored the dastardly killing of innocent people by terrorists near Jammu on Saturday, terming it as a “cowardly act of violence” against humanity. “We deeply mourn the loss of lives of these innocent people and strongly deplore this cowardly act of violence,” Lok Sabha Speaker Manohar Joshi said while making a special reference in the House. The whole House joined in condemning “this act against humanity, which was contrary to human ethos and has shocked the civilised world”. Both Houses of Parliament were later adjourned for the day without transacting any legislative business in memory of former Vice-President B.D. Jatti, and two sitting members who had died during the inter-session period. In the Lok Sabha, Speaker Manohar Joshi paid glowing tributes to Jatti, describing him as an “outstanding statesman” and a “man of letters”. In the Rajya Sabha, Chairman Krishan Kant said in his death, the country had lost an able administrator and an eminent social worker. Jatti had made a rich contribution to the high traditions established by his predecessors through his objectivity, impartiality, understanding and meticulous devotion to all matters concerning the Upper House, the Chairman said. The Speaker lauded the contribution made by Jagdambi Prasad Yadav, BJP member from Jharkhand, who had died last month in Tamil Nadu after a brief illness at 77. The Speaker condoled the death of former members Chandra Mohan Sinha, Gulsher Ahmed, Moti Ram Baigra, R.R. Patel and Mahendra Kumari. The House also condoled the death of former Lok Sabha Secretary General S.L. Shakdher. In the Rajya Sabha, Mr Kant made obituary references to sitting member Mukesh R. Patel, as also former members Chandra Mohan Sinha, Gulsher Ahmed, Jagdambi Prasad Yadav, Sundar Mohun Hemron and Mohd Masud Khan. Members in both Houses stood in silence for a short while as a mark of respect to them. Earlier, Prime Minister Atal Behari Vajpayee introduced L.K. Advani in the Lok Sabha as the Deputy Prime Minister amid thumping of desks by members. Mr Vajpayee also introduced the new ministers. The four Cabinet ministers are Babasaheb Vikhe Patil, Sahib Singh Verma, Shatrughan Sinha and K. Jana Krishnamurthi. Mr N.T. Shanmugham, Mr Sripad Naik, Mr Nikhil Kumar Choudhary, Mr Vinod Khanna, Mr Anant Geete, Mr Sanjay Paswan, Mr Dasangouda R. Patil, Mr A.K. Murthy, and Mr S. Thirunavukkarasar were also introduced. The atmosphere in the Lower House turned festive as new Health Minister Shatrughan Sinha, attired in a cream-coloured kurta and an embroidered jacket, walked in. He was the cynosure of all eyes. In his flamboyant style, the actor-turned-politician entered the House wearing sunglasses shortly before the proceedings began. He was greeted by ministerial colleagues, senior BJP leaders and other members. With a smile and a ‘namaskar’, Mr Sinha later went to the Opposition benches, where he exchanged pleasantries with Leader of Opposition Sonia Gandhi and shook hands with senior party members, including Shivraj Patil. There were warm handshakes from Samajwadi Party leader Mulayam Singh Yadav, CPM leader Somnath Chatterjee and TDP leader K. Yerran Naidu. A beaming Mr Sinha wished the Prime Minister and the Deputy Prime Minister before occupying the front row along with new Labour Minister Sahib Singh Verma. In contrast, his Bollywood colleague Vinod Khanna, Minister of State for Tourism, was seen carrying a file as he took his seat in the Treasury Benches. Mr C.P. Thakur, dropped as Health Minister, stuck to the middle rows while former BJP President K. Jana Krishnamurthi, was seated in the second row. Leading world powers have condemned the Saturday night terrorist massacre near Jammu. Russia’s Ministry of Foreign Affairs, in a communication with the Ministry of External Affairs here, said: “The present terrorist act in Jammu and Kashmir like yesterday’s attack on a group of foreign tourists in the north of Pakistan form part of the same chain of international terrorism which present today a major threat to peace and security, including in South Asia. “We emphasise that the first step in ending terrorism in Jammu and Kashmir is the consistent implementation of commitments given by the Government of Pakistan for preventing activities of terrorist groups on the territory under its control,” it said. The BJP today blamed Pakistan for the terrorist attack on a slum in Jammu and asked the USA and the UK to put more pressure on Islamabad to end cross-border terrorism. “Without the support of Pakistan, the terrorists could not have carried out this attack on innocent men, women and children,” BJP spokesman V.K. Malhotra said here. Mere condemnation of the attack, which took place on Saturday, by the UK and the USA was not enough, he said, adding that they should put more pressure on Pakistan to end cross-border terrorism. The spokesman said the Centre should take stringent steps to tackle militancy and hoped Deputy Prime Minister L.K. Advani’s statement in Parliament on the incident would spell out measures in this regard. Succumbing to Opposition pressure, the Vajpayee government decided to allow an adjournment motion in the Lok Sabha tomorrow to debate on the recent massacre in Jammu. The government decided not to oppose the adjournment motion as the leaders of the Opposition parties, during the all-party meeting today, threatened to disrupt the proceedings if it was not allowed, sources said. Congress leaders Shivraj Patil and Priyaranjan Dasmunshi supported by CPM leader Somnath Chatterjee strongly pressed for the adjournment motion, sources said. Deputy Prime Minister and Union Home Minister L.K. Advani, who was to make a statement on the Jammu massacre tomorrow, will reply to the debate.